Why Escape from Hell? 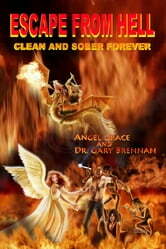 In Angel Grace's and Dr. Gary Brennan's book you will see the horrors the addicted go through. Walk down by the river and see how meth caused toothless addicts to be forced to live in cardboard boxes. Do they look like they are having fun? What if the thousands of studies proving that a dollar spent on rehabilitation saves ten dollars in costs are still not convincing enough? What if the drug rehab programs spotted across America that save money on jails and stolen goods do not make our leaders want to do more rehab? What if a whole nation has applied the basic principles of this book and found that they work? Would that make rehab worth more of a try for our leaders? Portugal is that country. Tony Newman, in a 7/6/11 Huffington Post, said that people in Portugal in possession of small amounts of illegal drugs, for the past ten years, are not arrested and sent to jail but must appear at a “dissuasion commission” where they are ordered into treatment. The results are decreased youth drug use, reduced overdose and HIV/AIDS rates, less crime, reduced criminal justice e expenditures, greater access to drug treatment and safer and healthier communities.